Home » Blogroll » Will Bankruptcy Ruin My Credit? There are many pros and cons to filing for bankruptcy. One of the most common concerns debtors have is the impact bankruptcy will have on their future credit score. Many consumers assume that filing bankruptcy will simply ruin their credit entirely and make it impossible to ever borrow again. This is not necessarily the case. What really happens to your credit after a bankruptcy? So how does a bankruptcy affect these calculations? The largest portion of your FICO score (payment history) has likely already been drastically reduced by the time you consider bankruptcy. If so, adding the public record of an official bankruptcy proceeding may not substantially lower this component. Surprisingly, the next-largest component of your credit score can actually be improved by bankruptcy. Once the bankruptcy has been discharged, you are legally absolved of the debts that were included. Thus, your debt burden becomes much smaller after bankruptcy, and that component improves. Depending on how the other components are scored in your particular circumstances, it is possible for the improved debt burden to increase your overall FICO score after bankruptcy. A Chapter 7 Bankruptcy stays on the public record for ten years. All other bankruptcy references are only in the public record for seven years. A common misperception is that a FICO score will remain low for as long as the bankruptcy is in the public record and reported to the credit bureaus. This is not necessarily true – remember, payment history is only one component of the FICO score. And even with a bankruptcy reported, your payment history component can be improved by reestablishing timely payments. 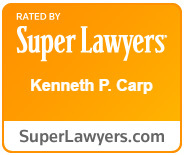 If you are experiencing financial difficulties, experienced Missouri attorney Kenneth P. Carp can help determine whether filing bankruptcy is right for you. Call (636) 947-3600 to schedule your consultation or contact us online.